Long ago, there was a world covered in endless sea. Upon these waters were two giants, titanic in stature, who clashed against one another with enough force to cause the surface waters to swell. The Bionis and Mechonis, respective creators of biological and mechanical life on this world, fought until each side caused severe damage to the other- enough so that each god lay dead, the blade of the Mechonis forever stuck in the abdomen of the Bionis. Of course, even the circle of life remains unbroken in this strange world, as new life continued to spring up on the surfaces of these corpses. Kind of reminds me of Final Fantasy. Despite being largely uninvolved in the conflicts of the titans, the respective peoples of the Bionis and Mechonis could not let go of the ancient grudges their progenitors shared. The Mechon, twisted, seemingly unfeeling machine beings of the Mechonis, began to wage war with the human-like Homs of the Bionis who had all but lost the fight. A ray of hope was needed to reignite the will to survive among the colonies of the Bionis… Instead, they got Shulk. 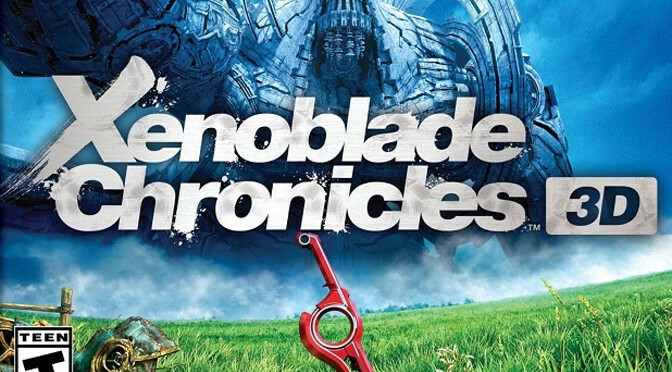 Xenoblade Chronicles, also known as, “The game that guy from Smash Bros came from” is a Japanese role-playing game in which it is easy to spend more than just a little investment of time. 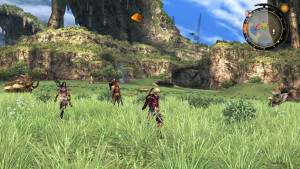 The story is a tremendous focus of the game, as a result, sending you on an adventure with Shulk and his compatriots. Shulk isn’t exactly your typical hero: He collects garbage from fallen Mechon to fashion simple weapons, performs errands for people around his colony (you’ll get to know these tasks more, later, as side quests) and he would pretty much just prefer to research technology or mysteries such as the Monado, rather than go and wage war against an army of sentient Roombas. The story of Xenoblade begins with a war won at an extremely steep cost: A soldier named Dunban, wielding a weapon called the Monado that is capable of slicing through Mechon with ease, engages hundreds, if not thousands, of enemy forces. The end result of the battle is that the Mechon are seemingly wiped out, while only a handful of Homs came back from the battle as survivors. The terrifying power of the Monado took a severe toll on the health of its wielder, all but immobilizing one of his arms and threatening to kill him should he ever try to use it, resulting in Shulk being its wielder when the Mechon turns out to be significantly less eradicated than the Homs thought when a giant faced Mechon appears to attack the home colony of Shulk and friends. A few visions, dead colonists and a destroyed city later results in Shulk leaving his destroyed home town to fulfill his revenge against the faced Mechon that took away people close to him, getting caught up in something much larger along the way. The story of Xenoblade is a very familiar one but epic in presentation, seemingly fitting for an adventure that takes place across the bodies of dead gods. The journey of Shulk and company is a long and dramatic one, filled with twists and a sense of hopelessness as characters from all sides fight and die along the way. The player’s party will band together with a strong sense of camaraderie that their development and contributions to the plot will only serve to further engross a player as they fight to survive. On the subject of fighting, Xenoblade Chronicles 3D features a very interesting real time battle system. Enemies are visible on the surface of the world or in dungeons and may ignore players or attack on sight or upon hearing you. Once combat has been engaged, players can lock on to an enemy and move around them with their currently selected character while the AI controls the other two active in the battle party. When near enemies, characters will do a weak, basic auto attack at regular intervals but real damage is produced through careful management of characters arts, each with their own cooldown. Some require certain positioning to be most effective, such as being behind a foe when using Shulk’s Back Slash, while others inflict status ailments or conditions like knocking foes over so additional damage can be dealt. Careful. Titans could be anywhere. 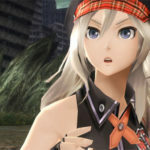 There are further implementations in the battle system, like the party gauge, tension, affinity cries, and the visions that Shulk has during cut-scenes are worked into the battle system as well. 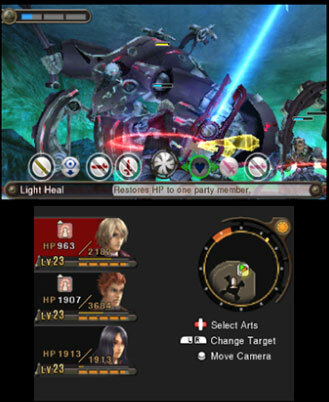 Enemies charging up to do a lethal attack may actually cause Shulk to have a vision of the attack- the screen will turn blue and it will show the target of the attack get slaughtered by it, then returns to the present where you can try to change what is about to happen by healing, buffing or warning the targeted character. The party gauge can be used for powerful Chain Attacks that has each party member turn to your target and beat it down with arts, in sequence, while high tension can lend more hits to a Chain Attack as well as buff critical hit rate and damage. There’s actually quite a good bit to the battle system in Xenoblade Chronicles 3D, so those who take time to understand the system will be well rewarded when approaching the game’s more difficult challenges. Each character in Xenoblade approaches combat in a different manner, as well, which becomes more apparent the further into the game you get and the more arts you unlock and upgrade. A mage character that joins later in the game has several arts that each have minor benefits, such as healing the team, while active but can deal damage by discharging them and removing the beneficial effects. Using this character yourself, chaining multiple spells in succession and releasing them all at once can help you deal major damage and keep your party protected or healed. 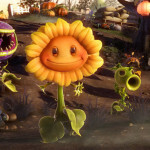 Each character has their own talent art as well as their own selection of arts and skills, the latter of which is even deepened by the Skill Link system featured in the game that allows players to share one character’s skills with another. Customization isn’t just in regards to skill links or upgrading the characters arts, either. All equipment in Xenoblade Chronicles results in a visual change in the character model, either being a palette swap or a whole new outfit or weapon design. Pieces of equipment may also have slots for gems players may find throughout the adventure or may create themselves, which gives players even more decision making to do when it comes to selecting weapons and armor. Losing out on EXP +200% or Lightning Damage +100% for a weapon with higher raw damage but no slots and vice versa is something players will have to think about a lot. The soundtrack for Xenoblade Chronicles 3D is superb, and while the music is not only sound in composition it is also utilized well during cutscenes to enhance the quality of event sequences by a significant margin. Noteworthy tracks are plentiful and the musical selection is always spot-on in lengthy scenes in which huge events are occurring: One particular track called Engage the Enemy is played early on in the game as a single character struggles helplessly against a giant foe to prevent it from absolutely crushing your current party, and the music helps a lot in pulling together the dialogue and action occurring on screen. Xenoblade is an extremely dramatic game and the slightest thing being off could damage how the audience receives a whole revelation, but the sound as a whole lends itself so well to wrapping up events that it becomes an even greater strength for the game’s storytelling. Choose your weapon! Or party? Heck, just choose everything. Of course, your mileage may vary when it comes to cut-scenes. 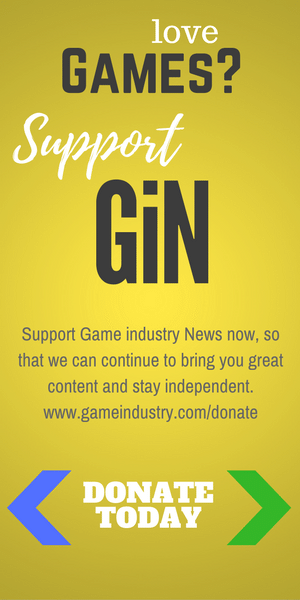 As mentioned before, they’re lengthy- upwards of ten minutes or seemingly longer in some cases, which can frustrate players who would just rather play. 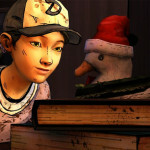 While on that subject, the in-game graphic engine is what renders the cutscenes, meaning that the less-than-stellar graphics show through quite a bit. 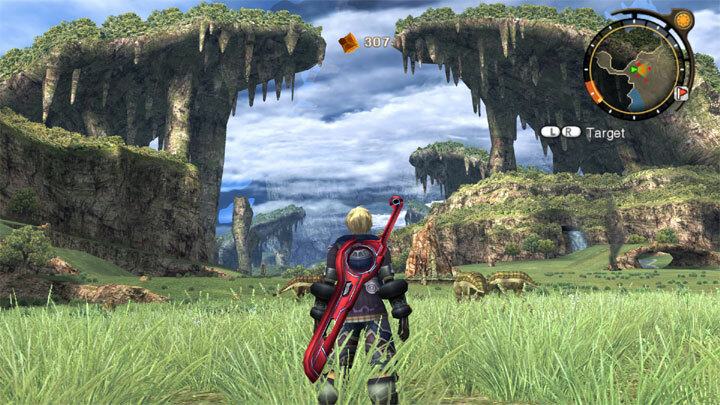 Xenoblade Chronicles on the Wii was not exactly a graphical powerhouse: While the draw distance on that machine was impressive, texture and model fidelity suffered a fair deal as a result. Much the same can be said of the 3DS version of the game- The environments and art direction still shine through as the colorful and exotic landscapes maintain their gargantuan size, practically demanding players explore them, but there is always a noticable little texture pop up here or extremely jagged surface there. Xenoblade Chronicles 3D is not the prettiest game on the 3DS, but it is easily one of the largest adventures for the handheld. Another sacrifice that had to be made for the 3DS game was the loss of dual audio, because while the English voice track is of decent quality and the music plentiful, the Japanese voices are lost to the ether, no doubt to make up for other components taking up more and more room on the 3DS game card. Those who dislike English dubs or English accents (for some reason or another) may lament the loss of dual audio in this release. To summarize: Xenoblade Chronicles 3D is a very lengthy adventure, first playthroughs taking some people upwards of 80-120 hours depending on how many side quests you want to complete, while full completionists may be looking at upwards of 200 hours. 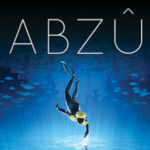 The game sounds fantastic, looks slightly below average and is missing the Japanese dialogue from its prior Wii release. The story does have cutscenes that are interminable in length to some, and while this wouldn’t surprise most fans of games like Final Fantasy X or Metal Gear Solid 4, it may bothersome. The combat is surprisingly in depth, only getting better as the player progresses, giving players a large number of options while not simultaneously punishing players for using the freedom given to experiment with different party setups. All in all, Xenoblade Chronicles 3D is a fantastic addition to the Nintendo 3DS library. Previous PostLet’s Play Life is Strange Episode 3: Chaos TheoryNext PostBook Series Wednesday: A New Venture!